In 1976, staurolite was named Georgia's official state mineral. Georgia has a wealth of minerals, among them staurolite crystals, popularly called "Fairy Crosses" or "Fairy Stones." Particularly abundant in north Georgia, the distinctively twinned, crossed crystals have been collected for generations as good luck charms. The Fairy Cross, is a natural phenomenon found in only a few places in the world. Fannin County in North Georgia just happens to be one of those places! 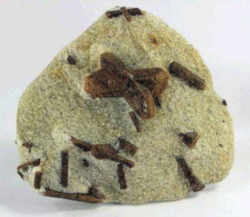 Staurolite is a common metamorphic mineral that is useful to geologists to determine the degree of metamorphism. Staurolite is a silicate mineral with a generalized chemical composition of (Fe,Mg)2Al9Si4O23(OH). It is usually brown or black in color with a resinous to vitreous luster. It ranges from transparent to opaque in diaphaneity. Staurolite is famous for its twinned crystals that form into the shape of a cross. Its name comes from the Greek for cross. The twin is a classic penetration twin where it appears as if two crystals grew into and out of each other. It actually forms two twin types; one that is nearly 90 degrees and one that is nearly 60 degrees. The 60 degree type is more common but the 90 degree type is the most sought after. 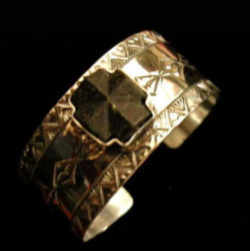 It was associated with Christianity as a symbol for the cross and as a good luck charm. It has been given the names "Fairy Stone" or Fairy Cross". Some scarcer specimens show both twin forms and can look like a blunt six rayed star. Staurolite is a mineral that is commonly found in metamorphic rocks such as schist and gneiss. It forms when shale is strongly altered by regional metamorphism. It is often found in association with almandine garnet, muscovite and kyanite - minerals that form under similar temperature and pressure conditions. Staurolite is usually easy to identify when it occurs as visible grains in a metamorphic rock. Grains of staurolite are typically larger than the grains of other minerals in the rock and they often exhibit an obvious crystal structure. They occur as six-sided crystals, often with penetration twins. Color is reddish-brown, brown, and black. Luster is vitreous to resinous to dull. Transparency crystals are translucent to opaque. Crystal Habits: the typical crystal are prismatic or tabular. Some crystals can have a pseudo-hexagonal cross-section but most are flattened into a more diamond shaped cross-section with two of the four points truncated. Twinning is seen in about 35% of the specimens encountered in nature. Twins are cross (+) or X-shaped and can be both at the same time. Crystals sometimes grown onto kyanite crystals. Cleavage poor, in one direction. 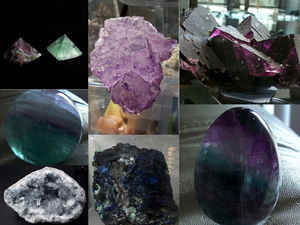 Associated Minerals include almandine, micas, kyanite and other metamorphic minerals. Notable Occurrences Ducktown Tennessee, Georgia, Virginia and Montana, USA; Brazil; Scotland, Italy and France. These mysterious little stones seem to do it all. They are considered good luck charms. Their average size is about an inch, making them easy to wear as jewelry or to carry around in a pocket. Staurolite is made of iron aluminum silicate crystals and the rare fairy crosses are actually two "twinned"crystals resembling a cross. Some people believe that they protect the wearer against withcraft, diseases and accidents. Some believe the crystals energize their sexual drive and bring wealth. 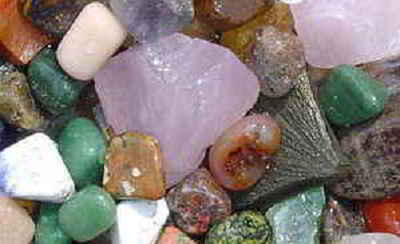 The stones are associated with the Four Elements- Earth, Air, Fire and Water. They're worn by those wanting to balance the Four Elements within. Legend has it that upon their first meeting, Pocahontas gave Captain John Smith a good luck charm necklace made of a fairy cross. Other famous people known to possess these cross shaped rocks are Thomas Edison, Charles Lindbergh and Teddy Roosevelt. 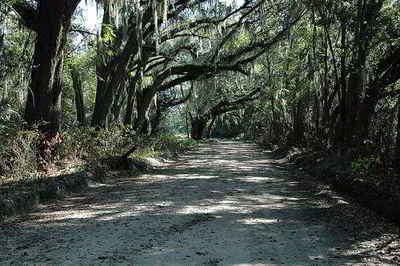 OFFICIAL STATE MINERAL, FOSSIL, AND QUARTZ DESIGNATED. No. 104 (House Resolution No. 517-1385). 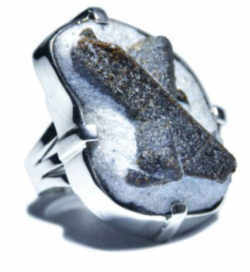 Designating staurolite as the official State mineral, the shark tooth as the official State fossil and quartz as the official State gem; and for other purposes. Whereas, the importance of Georgia's minerals to the industrial growth and heritage of this State should be appropriately recognized. 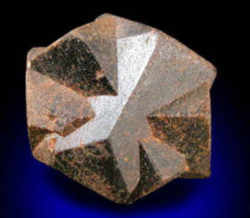 (1) Staurolite is designated as the State of Georgia's official mineral. 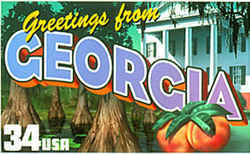 (2) The shark tooth is designated as the State of Georgia's official fossil. (3) Quartz is designated as the State of Georgia's official gem. Source: Ga. Laws 1976, pp. 567-68. The law designating the staurolite as the official Georgia state mineral is found in the Georgia Code, Title 50, Chapter 3, Section 50-3-59. Staurolite is designated as the official Georgia state mineral.